Finale was born here at AssN9 Ranch. His sire was our performance jack, Bluegrass Littlejohn, and his dam is one of our best producing halter jennets, Lil’ Angels Savannah. He is named Finale because he was the very last foal ever produced by Littlejohn. We were not sure if his mom was bred to Rowdy (and Rowdy has passed away in the meantime), so we put her in with Littlejohn. What a great surprise when we saw that little white face!! Finale won several NMDA performance and halter honors this year. He won the Oklahoma State Fair High Point Champion – Pregreen, and the State Fair of Texas High Point Champion – Pregreen. At the Wisconsin State Fair, Finale was awarded Champion Jack, and Grand Champion Donkey (against some very tough competition). He is a good representative of our breeding program…”Pretty, Performance, PERFECTION”! 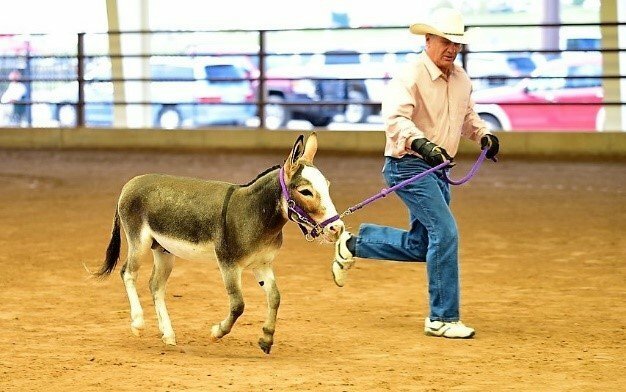 Finale also won the “Excellence In-Hand” award from the American Donkey Association (ADA). This is an award for accumulating points in multiple shows. You must compete under at least three different judges. Thank you ADA for offering this award! Finale is a little guy, so we will probably not ever train him to drive, but he loves the in-hand events, and is absolutely fearless. He and Jim make a good team. I am pretty sure Jim is partial to Finale above most of the other donkeys here at the ranch. Finale is the easiest jack to handle. He is not aggressive to other donkeys, he does not “mouth off” every time another donkey does, and just goes with the flow of whatever you ask him to do. He LOVES attention and is very patient with little kids. When we went to Wisconsin (which is a 14 hour drive from Oklahoma) he stood by the gate so all the little kids could pet him…for 4 days! All the other donkeys were standing in the corner with their heads hanging because they were so tired. But Finale stood by the gate so all his adoring fans could pet him. We are anxiously awaiting his first foal crop this year.